FU Orionis. Photo: ESO Online Digitized Sky Survey. 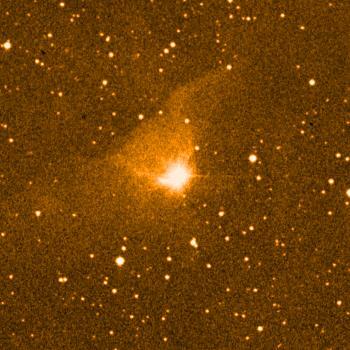 An FU Orionis star is a pre-main-sequence eruptive variable. FU Orionis stars appear to be a stage in the development of T Tauri stars. They gradually brighten by about six magnitudes over several months, during which time matter is ejected, then remain almost steady or slowly decline by a magnitude or two over a period of years. All known FU Ori stars (commonly known as fuors) are associated with reflection nebulae. The prototype is a cF5- to G3 Ia-type star, presently near the top of its Hayashi track. In 1936 it suddenly appeared in the middle of a dark cloud, and rose by 6 magnitudes in the photographic band. Its lithium abundance is 80 times that of the Sun and it has developed a reflection nebula.